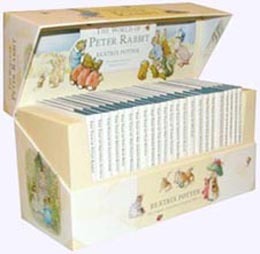 A beautifully designed gift box containing all 23 of Beatrix Potter's Original Peter Rabbit Tales - Peter Rabbit, Squirrel Nutkin, Tailor of Gloucester, Benjamin Bunny, Two Bad Mice, Mrs. Tiggy-Winkle, Mr. Jeremy Fisher, Tim Kitten, Jemima Puddle-Duck, Flopsy Bunnies, Mrs. Tittlemouse, Timmy Tiptoes, Johnny Town-Mouse, Mr. Tod, Pigling Bland, Samuel Whiskers, The Pie and the Patty-Pan, Ginger and Pickles, Little Pig Robinson, Fierce Bad Rabbit, Miss Moppet, Appley Dapply's Nursery Rhymes, Cecily Parsley's Nursery Rhymes. A perfect birth or christening gift. Peter Rabbit is a mischievous young hero on the run from Mr. Mcgregor in "The Tale of Peter Rabbit." 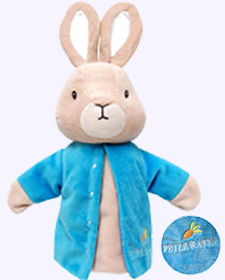 This super soft plush rabbit features Peter's signature blue coat as well as accurate details drawn from the original illustrations. He measures 14" sitting. Surface washable. 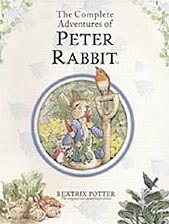 A classic volume of the complete and unabridged collection of Beatrix Potter's original 23 Peter Rabbit tales with original illustrations. In addition there are four earlier stories and an introduction about the history of this series. Hardcover (slipcase), 400pp, Ages 4 & up. 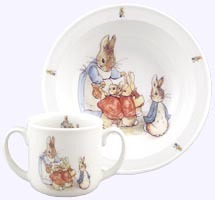 Classic Peter Rabbit from the illustrations of Beatrix Potter is 10" tall. Surface washable. 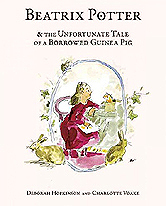 An original tale written by Oscar-winning actress and screenwriter Emma Thompson and based on the original tales by Beatrix Potter. In this story, Peter's adventures take him beyond the boundaries of Mr. McGregor's garden and all the way to Scotland! With 72 pages of beautiful text and illustrations, this hardcover picture book, which includes an audio CD of the story narrated by the author, is sure to become a classic--and a collector's item! Hardcover, All Ages. 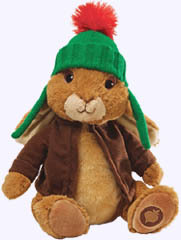 Small Plush Classic Benjamin Bunny is 7" tall. Surface Washable. Ages 1+. Hardcover 6" Picture Book of Peter's reckless cousin's ventures into Mr. McGregor's garden. 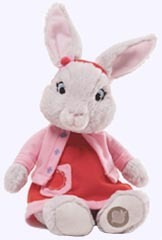 Small Plush Classic Flopsy Bunny in her red jacket is 7" tall. Surface Washable. Ages 1+. Hardcover 6" Picture Book of The six Flopsy Bunnies who have a narrow escape from Mr. McGregor's garden. Small Plush Classic Jemima Puddle-Duck is 8" tall. Surface Washable. Ages 1 & up. Hardcover 6" Picture Book of The Tale of Jemima Puddle-Duck who was annoyed because the farmer's wife would not let her hatch her own eggs. The Plush Storybook Character sits 7" tall. Surface Washable. Ages 1 and up. 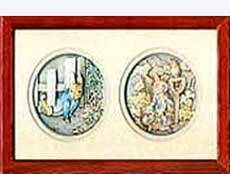 Hardcover 6" Picture Book of The Tale of Peter Rabbit has six extra illustrations which were omitted in later editions. 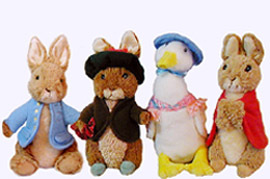 Plush Classic Peter Rabbit, Benjamin Bunny, Jemima Puddle-Duck, and Flopsy Bunny would be great companions for the Peter Rabbit Gift Book Set. Each storybook character is 7" tall. The plush dolls may also be purchased separately as above. 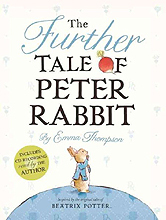 The four Beatrix Potter stories that feature Peter Rabbit are brought together in one volume so that his escapades can be follwed as a continuous saga. 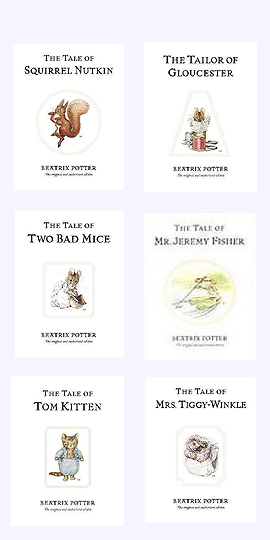 The four stories - The Tale of Peter Rabbit, The Tale of Benjamin Bunny, The Tale of The Flopsy Bunnies and the Tale of Mr. Tod - appear here with their full text and all their original pictures. Hardcover Illustrated Chapter Book. Ages 5 & up. These wooden bookends are a beautiful addition to any room. 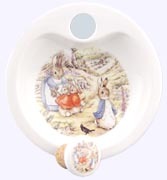 The design features Peter Rabbit and Jemima Puddle-duck. 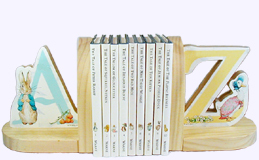 Made from high-quality wood, the bookends will hold all of your favorite books in place. Gift boxed bookends measure 10.5" wide and stand 6" tall. Ages 3 and up. Hardcover books are 4" x 5 1/2". Ages 3 - 5. Price $6.99 ea. Pull open the ingeniously designed drawer to reveal 12 of Potter's most popular tales in adorable, miniaturized paperbacks. The complete text and art of each tale is included, and the small size gives an added appeal to the charm of Beatrix Potter's original stories. Minature book Set is 4.25" long and 3 1/2" wide. A perfect birth or christening gift. 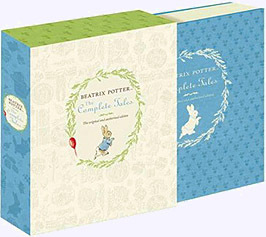 This brand-new eco-friendly boxed set includes four classic Beatrix Potter tales that meet "naturally better" criteria and showcase their "green" appeal with the eye-catching vine cover design. Titles included are: The Tale of Peter Rabbit, The Tale of Mr. Jeremy Fisher, The Tale of Tom Kitten, and The Tale of Jemima Puddle-Duck. Hardcover books are 4" x 5 1/2". Ages 3 - 5. 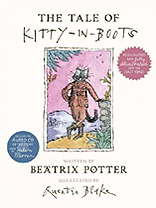 Written in 1914 by Beatrix Potter but never illustrated, The Tale of Kitty in Boots has been made complete by illustrations from Quentin Blake. When one serious, well-behaved young black cat named Miss Catherine St. Quintin � or Kitty for short � decides to go a-hunting, she gets much more of an adventure than she had anticipated. In a tale dotted with familiar faces from Beatrix Potter's other classic tales such as Mrs. Tiggy-winkle and Mr. Tod, Miss Kitty quickly finds that hunting is dangerous as she goes from predator to prey. Hardcover Picture Book with dedication page and audio CD read by Helen Mirren. 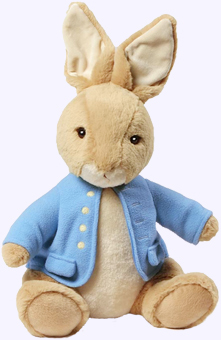 With his embroidered jacket, this 8" Peter Rabbit doll will sit by your child as they enjoy his adventures. Machine Washable. Safe for all ages. Satin trimmed blankie is 12" hanging and unfolds to 14" x 14". 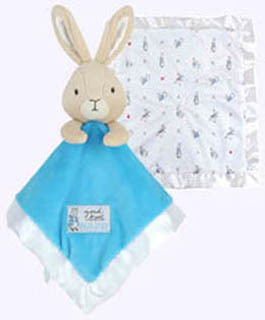 Peter Rabbit has a crinkle in his ears and is machine washable. Reverse side of blankie has multiple images of Peter Rabbit. Ages 0+. Flopsy Bunny is soft and cute as can be. She is machine washable and 12" tall. Ages 0+. Flopsie Bunny has a crinkle in her ear and is machine wahable. Flopsie blankie is trimmed in satin, is 12" hanging and unfolds to 14" x 14". Reverse side of blankie has multiple images of Flopsy Bunny. Ages 0+. 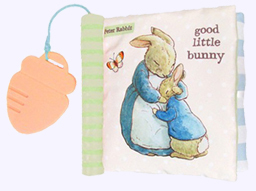 Peter Rabbit Good Little Bunny Cloth Book has a squeak, crinkle sounds and multiple textures. The brightly colored teether spine has a hanging carrot shape teether. 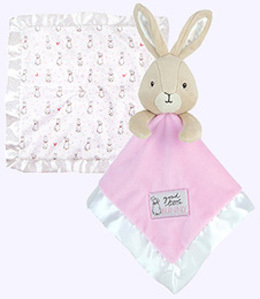 It is infant safe and makes a great gift for any newborn. Cloth Book is 6.5" tall. 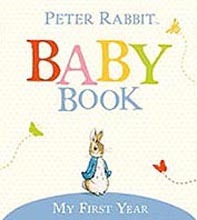 This book records the story of the first twelve months of your baby's life. There are spaces for you to note the many exciting events in your baby's development, from the first smile to the first party, and room to attach photographs at every stage. A pocket at the back enables you to store precious keepsakes, such as your baby's hospital bracelet or a lock of hair. You will have a complete journal of your first year together for all the family to treasure. 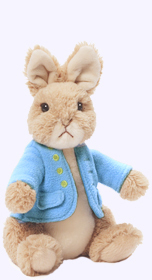 This soft 7" Peter Rabbit hand puppet is just right for small hands. Machine washable. Safe for all ages. Feeding Set includes 8.5" sectioned plate, bowl, sippy cup, fork and spoon. 5 piece melamine set is top rack dishwahser safe. Set is attractively boxed for gift giving. Ages 6 mos. & up. This set of ceramic boxes helps parents store precious moments of childhood: their first curl, and first baby tooth. 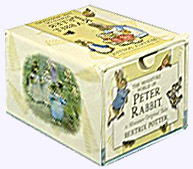 Each box is decorated with designs from original Beatrix Potter illustrations and measures approximately 2" long and 1" high. The set is packaged in a gift box. 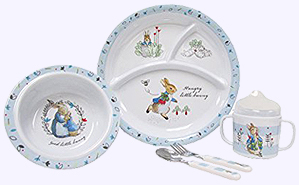 Porcelain Breakfast Set made in Germany features Peter Rabbit in the garden along with Mrs. Rabbit, Flopsy, Mopsy and Cottontail. 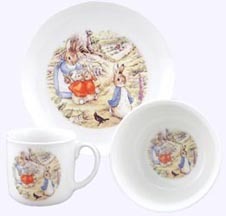 Set contains 7" dish, 5" bowl and cup. Set is attractively boxed for gift giving. Porcelain warming dish is made in Germany. 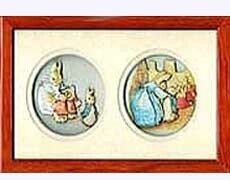 Peter Rabbit, Mrs. Rabbit, Flopsy, Mopsy and Cottontail are shown. 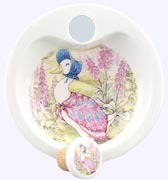 The traditional 7" warming dish features a port for filling the interior of the dish with warm water and a cork plug with decorative porcelain cap. With the plug in place the child's meal is kept warm while eating. Set is attractively boxed for gift giving. Porcelain warming dish is made in Germany. Peter Rabbit is in the garden along with Mrs. Rabbit, Flopsy, Mopsy and Cottontail. The traditional 7" warming dish features a port for filling the interior of the dish with warm water and a cork plug with decorative porcelain cap. With the plug in place the child's meal is kept warm while eating. Set is attractively boxed for gift giving. Porcelain warming dish is made in Germany. Jemima Puddle Duck is shown. The traditional 7" warming dish features a port for filling the interior of the dish with warm water and a cork plug with decorative porcelain cap. With the plug in place the child's meal is kept warm while eating. Set is attractively boxed for gift giving. 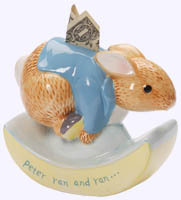 This ceramic rocking bank features Peter Rabbit in a running pose with the message "Peter Ran and Ran and Ran." Bank is 5.7" in length and is packaged in a closed gift box. 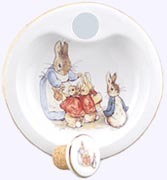 Three-dimensional de'coupage figures of Beatrix Potter's Peter Rabbit characters. Beautifully framed in lacquered wood shadow boxes. Created at the Studios of John Ellam in England. 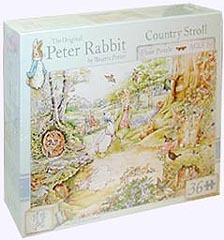 Double Cameos are 6.25" x 9"
Beatrix Potter Characters are depicted in a pastoral setting in this floor puzzle that will engage a childs imagination as they fit the pieces together. 36 Piece Floor Puzzle. 24" x 36" Ages 3+. Peter Rabbit from the Nickelodeon TV Series, Here Comes Peter Rabbit! He sits 10" tall. Surface Washable. Ages 1+. Lily Bobtail from the Nickelodeon TV Series, Here Comes Peter Rabbit! She sits 10" tall. Surface Washable. Ages 1+. 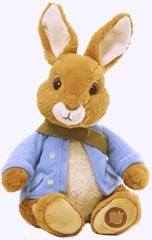 Benjamin Bunny from the Nickelodeon TV Series, Here Comes Peter Rabbit! He sits 10" tall. Surface Washable. Ages 1+.